.rpt Inspector Enterprise Suite is a powerful seamlessly integrated suite of 19 tools. Mass Edit, Mass Manage, Mass Monitor, and more! Edit, Analyze, Document, Change, Version Control, Standardize: Schedules, Instances, Data source / Database (set location, change data source, convert driver, verify database), Formulas, Text, Parameters, Sections, Colors, Printers, etc. .rpt Inspector Online a new SaaS / cloud solution is now released and is FREE! click here to get started! Announcement: .rpt Inspector Professional Suite and .rpt Inspector Enterprise Suite are now in End Of Life (EOL) status. .rpt Inspector Online runs in modern browsers (Mozilla Firefox and Google Chrome are supported, Internet Explorer support may be offered later) and supports Windows 7, Windows 8.1, and Windows 10 as well native support for Crystal Reports 2016 down to Crystal Reports 8.5 reports. .rpt Inspector Online includes analysis, documentation tools, and now Change Data Source and Formula Editor features with additional in development. It is our intention to gradually add additional features, and have feature parity with the desktop tools (where possible) in later versions. .rpt Inspector Enterprise Suite builds on all the features and functionality of .rpt Inspector Professional, adding integration of BusinessObjects Enterprise & Crystal Enterprise and extending the toolset to work with Crystal Reports objects (underlaying design objects such as sections, formulas, text, parameters, database, colors, etc.) and associated meta-data for Instance Monitor & Instance Management; Schedule Monitor & Schedule Management; and Version Control Integration. 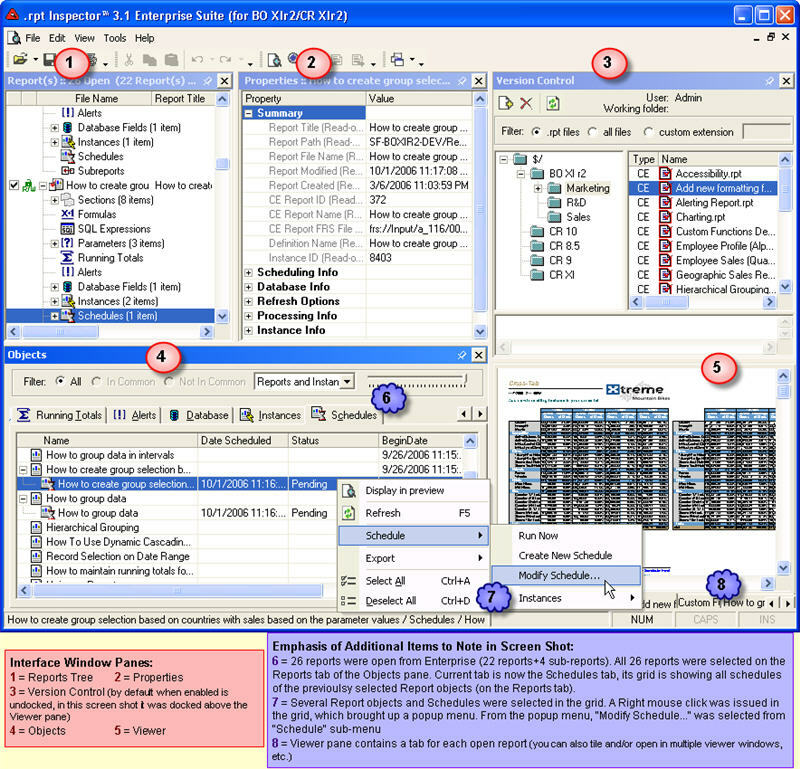 Unlike Crystal Reports, Central Management Console (CMC), or BusinessObjects Enterprise InfoView / Crystal Enterprise ePortfolio -- with .rpt Inspector Enterprise Suite you can open one, two, a hundred, or several hundred Crystal Reports objects and/or Instances and/or Schedules -- all at the same time1! Use the tools in .rpt Inspector Enterprise Suite to find and filter in common Crystal Reports design objects and properties (formulas, parameters, parameter default values, text, headers, footers, size, driver, database, printer, schedules, instances, database logons, formats, destinations, etc.) across the selected Crystal Reports and modify them all at the same time -- all with visual feedback. Unlike BusinessObjects Enterprise / Crystal Enterprise, with .rpt Inspector Enterprise Suite you can modify existing recurring schedules, reprocess a failed instance (fix the problem (i.e. missing parameters, database logon info, wrong e-mail destinations, etc.) without re-creating settings from scratch), reprocess a success instance (use the same settings but get latest data or modify a setting), and of course create new schedules and new instances, use version control and a lot more. Read further for details and screen shots of each of the 19 tools which are integrated in to this powerful suite. Waiting for BusinessObjects Enterprise XI 3.x support? Click for details. move your Crystal Reports to a different database with the same tables & fields? migrate your Crystal Reports to a different database and/or different driver? rename or remove fields and update the mappings in your Crystal Reports to reflect the changes? The Data source / Database Migration and Conversion wizard makes this process quick and easy. You can literally make changes to hundreds of Crystal Report's data sources and/or databases, update field mappings, and more in minutes. Note that there is currently limited support for stored procedures (currently only stored procedures without parameters are supported as we do not prompt for those parameters -- this is expected in a future version). find failed / success / pending / paused instances? analyze why an instance failed, when it was run, who it was run by or any number of instance properties? Our Instance Monitor tool makes it quick and easy. When you open Crystal Report(s) directly from BusinessObjects Enterprise or Crystal Enterprise (as opposed to opening a Crystal Report on the file system), .rpt Inspector Enterprise Suite automatically retrieves their meta-data -- Enterprise specific properties which are stored in the CMS database and displayed in InfoView, CMC, ePortfolio (i.e Report ID, FRS Path, Instance Info, etc.). Fact: Once you create a recurring schedule in Business Objects Enterprise or Crystal Enterprise, you can not modify its properties (i.e. schedule, destination, database, format, parameters, etc.). Instead you must create a new recurring schedule and re-enter all the information. Fact: If a scheduled instance fails in Business Objects Enterprise or Crystal Enterprise, you can not reprocess (create new instance based on failed instance properties) it and modify its properties (i.e. database info, destination, format, parameters, etc.) to fix the problem. Instead you must create a new schedule and re-enter all the information. Fact: Once an instance has been processed and has a status of success, you can not reprocess it (i.e. run it again with same properties but get latest data, or maybe even modify some of the properties and get latest data) in Business Objects or Crystal Enterprise. Fact: You can not create a new instance or create a recurring schedule on behalf of a user in Business Objects Enterprise or Crystal Enterprise. Instead, the user you are logged in as will be used. Fact: You can do all of the above and more with .rpt Inspector Enterprise Suite! Our Instance Manager tool makes it quick and easy. When you open Crystal Reports object(s) directly from BusinessObjects Enterprise or Crystal Enterprise (as opposed to opening a Crystal Report on the file system), .rpt Inspector Enterprise Suite automatically retrieves their Enterprise specific properties (i.e. Report ID, FRS Path, Instance Info, Schedule Info, etc.). Destination, Database, Format, Parameter, etc. ), you can modify the recurring schedule directly -- even across multiple recurring schedules across multiple Crystal Reports objects and folders at the same time. Fix the reason your schedule / instance failed (missing or wrong Database Logon Info, missing or wrong Parameter values, etc.) or get the latest data from a success instance. In seconds you can easily find and select your instances by status (or other property) and take appropriate action (reprocess, delete, pause, resume, document, etc.). Schedules / Instances typically fail because of missing database logon information or missing parameter information. Now instead of having to create a new schedule / instance from scratch, you can select existing failed or success instance(s) and reprocess (create a new instance) based on existing information in the instance (i.e. Database, Destination, Format, Parameters, etc.) or modify some or all of that information before creating a new instance. You you can Delete / Pause / Resume instances across one or many Crystal Reports and folders at the same time. Ever wish you could take advantage of version control features such as Check in / Check Out, History, etc.? Ever wish you could know if someone else is working on (modifying) the same report you'd like to change? Now you can. Our native and seamless integration with Microsoft SourceSafe1 gives you the power, flexibility, and most of all -- ease of use with our automated Business Objects Enterprise / Crystal Enterprise and Crystal Reports file system version control tool. Once a report has been added to version control via .rpt Inspector Enterprise Suite, we make the process of working with this Crystal Report easy. Whether you open the Crystal Report directly from Business Objects Enterprise / Crystal Enterprise or the file system. Navigate to the proper folder using the cryptic folder and file names. When you add a report to version control, it's file name is used for reference. Since the Business Objects Enterprise / Crystal Enterprise file names are cryptic, they will be cryptic in your version control repository. Right click on report and select "Add to Version Control"
Reports added to version control via .rpt Inspector Enterprise Suite use the report's title and all references to them are always in a friendly format. How would you rather work? We've made working with version control a breeze. 1 Microsoft Visual SourceSafe does not come with .rpt Inspector Enterprise Suite. It is a seperate product from Microsoft. If you use another version control repository -- let us know you'd like to see support added for it. which fields are in use or not in use? what field types (string, numeric, etc.) are used for your fields? what database, driver, etc. is used in your Crystal Reports to do an impact analysis? Our Database Analyzer tool makes it quick and easy. When your Crystal Reports are open, we retrieve all data source and database related properties and expose them to you in a property list for you to make your analysis. To further ease your efforts, you can group by any of these properties to quickly and easily get to the information your looking for. which report has a formula definition that contains "*.20"
which text objects contain "Acme Corp."
Use our powerful search and replace engine. You can search for specific text even if you're not sure of all the places it resides (text objects, parameter objects, formula objects, etc.). It's easier than ever to find what you're looking for and/or replace it with something else. You can even fine tune your search by specifying which specific types of objects to search. And if you want to get even fancier, you can take advantage of our pattern matching search and/or replace* which uses regular expressions. Now you can modify the various properties of your text objects with ease. And it's integrated with our Spell Checker tool with offers custom dictionaries. Our Formula Editor allows you to quickly and easily find in common formulas, apply changes to one or multiple formulas at the same time, and copy and paste formula definitions -- across one or many formulas -- across multiple Crystal Reports. All in a powerful easy to use Formula Editor that supports formula validation checking and keyword syntax highlighting in your choice of Crystal or VB formula syntax. And it's integrated with our Spell Checker tool. It's now easier than ever to standardize and update your parameter's default values. With our Parameter Editor (default values editor) you can select multiple parameters across one or many reports and you can append or overwrite default values with ease. Another way to work with parameter default values is our one-to-many copy relationship. This allows you to select your source, copy its values, and paste them to as many destinations as necessary. And it's integrated with our Spell Checker tool. It's now easier than ever to standardize and update your SQL Expressions. Our SQL Expressions Editor lets you work with the various properties that make up SQL Expressions. The DefinitionText property is powered by the same powerful Formula Editor that supports formula validation checking and keyword syntax highlighting in your choice of Crystal or VB formula syntax. And it's integrated with our Spell Checker tool. When you design a report, in addition to the database fields you can put on the design, can also create various objects (Box, Text, Formula, Parameter, SQL Expression, etc.) and put some or all of them on the design of the Crystal Report. The Objects Editor is designed to work with only those objects that appear on the design (the objects that are in use) of the report. Those objects that do not appear on the design (those that were created but are not being used) can still be accessed and worked with their respective editors (Formula, SQL Expression, Parameter, Running Total, Alert, etc.) on the respective Tab of the Objects Grid. Now you can see and modify the various properties of your objects with ease. All conditional formulas are powered by the same powerful Formula Editor that supports formula validation checking and keyword syntax highlighting in your choice of Crystal or VB formula syntax. And it's integrated with our Spell Checker tool. It's now easier than ever to analyze your Running Totals. It's now easier than ever to work with sections using our Section Editor which allows you to modify the various properties of your sections with ease. The default printer that is set in your reports can impact the final look and feel of your Crystal Report -- both in the viewer as well as when exported. Use our Printer Change Wizard to quickly and easily change the default printer and its properties across multiple Crystal Reports at the same time. It's now easier than ever to standardize and update your Alerts. With our Alerts Editor you can work with various properties. The formula modifications are powered by the same powerful Formula Editor that supports formula validation checking and keyword syntax highlighting in your choice of Crystal or VB formula syntax. And it's integrated with our Spell Checker tool. Now you can spell check your text and even add custom words to the dictionary. No more embarrassing typos. The spell checker is available in our Text, Formula, and Parameter editors. Do you work with the same sets of Crystal Reports? You no longer need to open them one at a time (even if you select multiple Crystal Reports in the open dialog you'll love this feature). Just like an MP3 playlist, you can create a virtually unlimited number of Report Lists. Add to each report list any number of Crystal Reports you'd like, from any directory on your system or mapped drive. Then click on a report list and it will automatically open all Crystal Reports in the list. In addition to showing you open sub-reports as a separate tab (configurable in TOOLS | OPTIONS), we have now given you the ability to open a virtually unlimited amount of preview windows. Simply right click on one of the report tabs in the preview viewer pane and select Open In A New Window open. But we didn't stop there. You can drag and drop the report tabs between all open preview windows. And if you want your sub-reports to automatically follow, turn it on in TOOLS | OPTIONS. This powerful feature allows you to quickly and easily see your changes come to live to multiple previews at the same time. .rpt Inspector 3.1 Enterprise Suite allows you to logon to your APS/CMS and browse a list of virtual folders to select your Crystal Reports objects. Now you can open multiple Crystal Reports objects at the same time directly from BusinessObjects Enterprise (BO) / Crystal Enterprise (CE) and .rpt Inspector Enterprise Suite will also automatically retrieve their meta-data. No longer do you need to map drives to your CE server and deal with cryptic folder and files names. connects to Crystal Enterprise 9 and reads Crystal Reports 5.x - Crystal Reports 9 & writes in Crystal Reports 9 file format. connects to Crystal Enterprise 10 and reads Crystal Reports 5.x - Crystal Reports 10 & writes in Crystal Reports 10 file format. connects to BusinessObjects Enterprise XI and reads Crystal Reports 5.x - Crystal Reports XI & writes in Crystal Reports XI file format. connects to BusinessObjects Enterprise XI Release 2 and reads Crystal Reports 5.x - Crystal Reports XI Release 2 & writes in Crystal Reports XI Release 2 file format. Just like you can open a single Crystal Report at a time directly from "Enterprise Folders" using Crystal Reports -- with .rpt Inspector 3.1 Enterprise Suite you can open One, Two, Three, or several Hundred Crystal Reports objects at the same time directly from "Enterprise Folders". We've extended the familiar "Enterprise Folders" dialog to support selection using CTRL + CLICK as well as SHIFT + CLICK, and even a mode that allows you to select an ENTIRE folder -- with even its sub-folders. For Crystal Reports that you open from Business Objects Enterprise / Crystal Enterprise "Enterprise Folders", .rpt Inspector 3.1 Enterprise Suite automatically retrieves their numerous BusinessObjects Enterprise / Crystal Enterprise specific Properties for you to Analyze and/or Modify (i.e. Report ID, Instance ID, FRS path, # of total instances, # of failed instances, # of successful instances, failure reason, schedule info, schedule type, destinations, database logon, formats, parameters, and many more -- see additional screen shots in other sections below). In version 1 we supported ODBC for the preview viewer and the datasource wizard. As of version 2, we've greatly expanded our connectivity support. Now updated with native support for Crystal Reports stored in Business Objects Enterprise / Crystal Enterprise. Now when enabling the preview viewer and making a connection to a database, you'll be prompted to enter a user id and password if necessary on all supported connectivity methods. For connectivity methods that require specifying more information then just a user id and password (OLE DB and Native drivers) we completely support this too. Originally introduced in version 1, our patent pending technology allows you to quickly and easily analyze properties across objects and reports. Drag and Group is the concept of selecting item(s) in the Objects pane, and dragging one or more properties from the Property pane down to the Objects pane (to any grid on any tab) to create a new column. Then right clicking on the column header and selecting group by object name (where the object name is the name of the column; i.e. font; font color, formula, etc.). The result is a pivot view. And now as of version 2, we've further optimized performance on grouping and moving items within the groupings (top / bottom / up one / down one). Plus we've exposed the grouping level color configuration and added support for auto-refresh of groupings. All window panes and menus dockable and floatable. This gives you ultimate control of the user interface to customize as you see fit. Many editors (text, formulas, parameters, etc.) have also support docking. With our dockable and floatable window panes and menus, you'll want to customize the layout that suits you best. So we've given you the ability to save a virtually unlimited number of customizable layouts that you can quickly and easily switch to on the fly. But don't worry. It's easy to return back to the default layout at anytime. How do I receive a key code to unlock a product? Can I do a “search and replace” through a formula? Which Crystal Reports (CR) file versions / file formats can I save in / write in with .rpt Inspector? I have made changes, but they do not seem to save.